GFI Backup Business Edition version 2010 (Software Review) - TACKtech Corp.
GFI Backup Business Edition (GFI BBE) has many features that system administrators will find useful. For one, it is a centralized backup solution that includes a web-based administration tool. 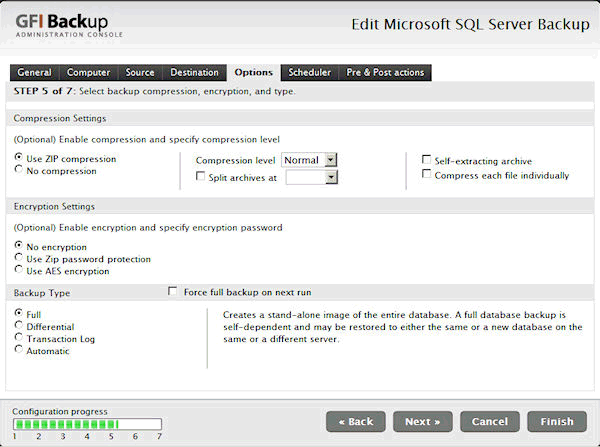 Also, GFI BBE has the capability of backing up SQL data and using Zip64 Compression. A centralized backup solution is where one server hosts the backup application, then it reaches out and extracts data from remote servers or workstations, and then retrieves the data. The retrieved data can be stored on the same server with the backup software, on CD/DVD, remote NAS, Flash Drives, or even FTP with auto-resume. 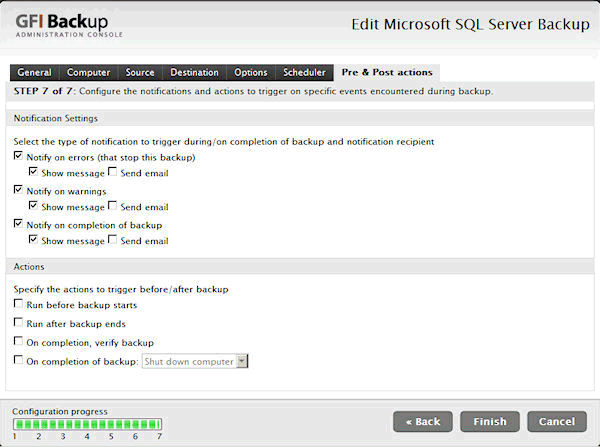 The back up criteria is setup through the web-based administration page. GFI BBE's administration tool is very functional, not cluttered. In my test, I installed GFI BBE on a Windows 2003 Advanced Server with P4 3 GHz, 2 GB of ram, and 1 TB hard drive. The server was connected to a 10/100 network, and was able to communicate with 5 other machines, including 1 SQL server. I installed the backup client on two of the machines and used the network access to successfully extract data off of the other machines. The SQL server data retrieval proved to be fast, and easy to setup. 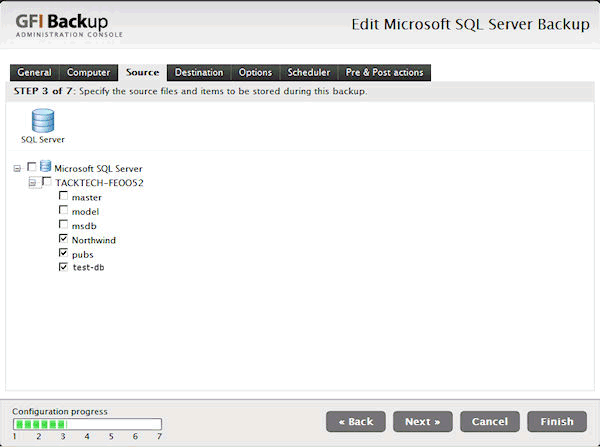 Once the SQL server was online for testing, it took a few simple clicks to navigate through the administration site, create a new backup job for the SQL server, and pull the databases I wanted. Another great function is GFI BBE's use of the Zip64 compression method. It allows the archives with WinZip® to be opened, even if GFI BBE is not installed. This non-proprietary format provides a lot of portability. GFI BBE includes all the standard options of backup types (Full, Incremental, Differential, and Auto). Also, you can setup exclusion filters for files or directories. This is useful if you have a web server and you don’t want to backup the log files, which can be very large. Whether the backup task was successful, or it failed, the backup task can be setup to email you the results. In our review of GFI BBE we never had a crash, or a failure of a task to run. GFI BBE is a very nicely written piece of software that has lots of options, with the ability to do what you need it to, and still be reliable. GFI BBE has all of the standard backup options, plus many more that can make your job as a system administrator much easier. GFI BBE is reasonably priced. Current pricing is available here. In final thoughts, we would have no problems running this software on our own servers. Pre & Post Backup Options.